New Year’s resolutions are one of the most commonly broken goals of all time, but why is that? People see the New Year as a time to reinvent and better themselves in some way, which is a great goal to have. However, whether it’s learning a new language, the piano, or simply sticking to a diet, people just let their New Year goals slip through their fingers. 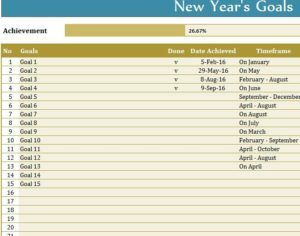 The free New Year Goals Template was designed to help keep your mind focused so you don’t go into the next year empty handed. This sheet is simple and straightforward, list out your goals and the steps you’re going to take to accomplish it so you can stay in the right state of mind all year round. To download this free template, just click the link at the bottom of this page. Now, start at the top of the page and start listing out your goals. This can be different goals or subtasks that will help you achieve one specific goal. For example, if your goal is to lose weight, you would want to list out the dietary steps and the number of times you’re willing to work out each week as well. You will see a table where you can list the number for your goals, so you can complete them chronologically, the description of your goal, a space to verify if the task has been completed, the date achieved, and the timeframe in which you want to complete it. In the next section of the table, you can watch your progress on a simple monthly chart. When a task is completed, you will see a nice “Done” sign in this calendar section. This template makes planning and organizing your goals into simpler tasks easy, giving you the confidence to follow through on your goals this year.